Today’s ride would start with a ride along Washington highway 20, otherwise known as the North Cascades Highway. It would end with a ferry ride and a nice easy roll down the west side of Puget Sound to my friend’s place on a nice little island. Good news: the morning started with a cloudless blue sky. Bad news: even though it was before 10am, the temperature in Omak was already 84ºF (29ºC). The forecast was for highs in the mid 90s (33-35ºC) but I knew (hoped, really) that it would be cooler in the mountains. I rode the few miles down to the WA20 junction in Okanagan and turned west. My route app, Waze insisted that I ride south to I90 to get to my destination near Shelton, WA. Consequently, it was doing it’s very best to re-route me back the way I’d come. Since her (my selected voice in Waze is female) frequent instructions were mashing over the music I was playing in my headset, I eventually pulled off under the shade of a lodgepole pine and turned that damn thing off. West of US97, the elevation changes along WA20 start almost immediately. You ride through a low pass and down into the small town of Twisp. Even this slight rise in elevation dropped the temperature a few degrees and wearing full leathers in the unbroken sun became much more tolerable. West of Twisp the Cascades start to present themselves in full grandeur. 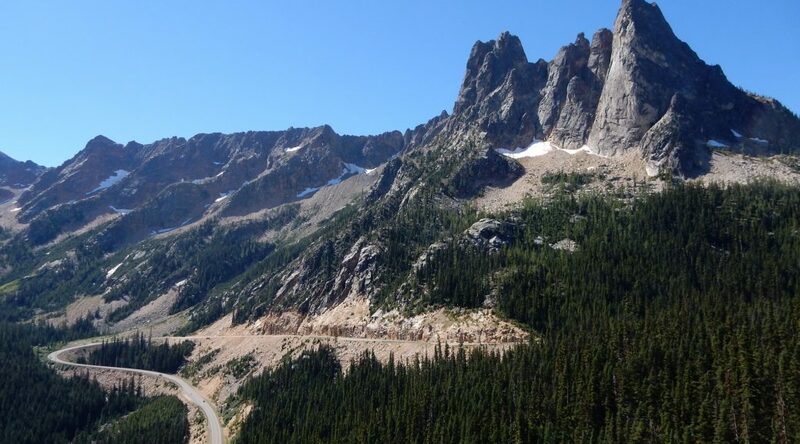 It’s not overly twisty but pleasantly curvaceous as you rail around sweepers on a long uphill climb to Washington pass. Approaching the pass the character of WA20 changes quickly. You take one switchback into a steep climb to the pass and the rest of the rise is a exceedingly long downhill (for the most part) ride with a multitude of medium speed curves that you can generally whip around with authority. Before you start downhill, however, you’re obligated to stop at the Washinton Pass overlook. It’s a short 150 yard (137m) hike to the cliff side with a commanding view of the valley and the switchback that you just rode through. I find the North Cascades to be a more colorful mountain range. For all the awe-inspiring majesty of the Canadian Rockies, they are primarily above the tree line and not as well forested. The Cascades, especially the western slope, are practically a rainforest. Many of the trees are not just green from it’s own needles/foliage, but they’re also covered in bright green moss. It’s an impressive site. As you decend the pass to the west, you enter the Skagit River valley, and this river that has been dammed several times. 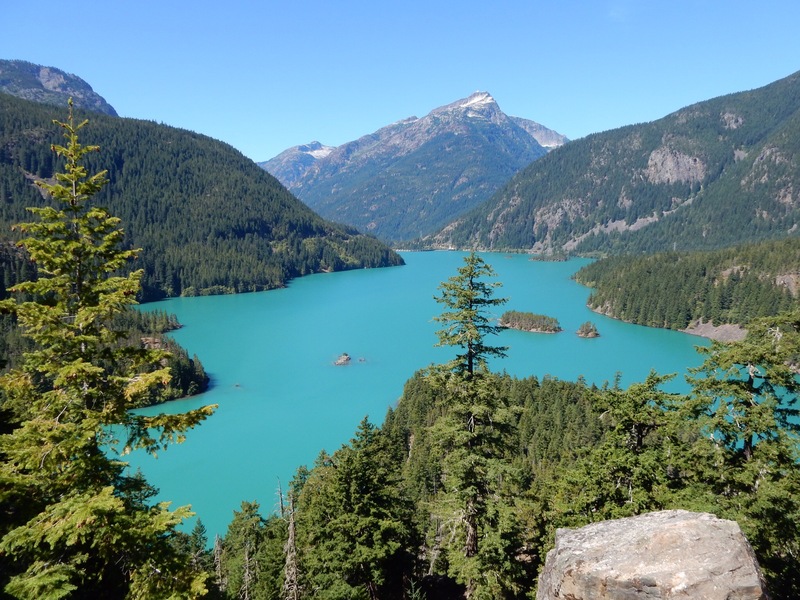 The dams of along the Skagit River create gorgeous glacier-fed lakes of the most brilliant aqua color. I stopped at a few places to take photos of the reservoirs. Down the mountain from the dams and reservoirs, the landscape flattens out a bit and the congestion level and number of stop lights increase. This means that you’re getting closer to Burlington, WA. The primary reason for all this congestion is the one major, defacto standard, for the most part only, highway that traverses the east coast of Puget Sound. Interstate Highway 5 is the west coast answer to I95 out east. The I5 is always busy, often jammed up, universally hated, but still begrudgingly required. Due to all of these not-so-flattering characteristics, I avoid the I5 like a case of the clap. The good news for me is that I have an alternative route to get to the Olympic peninsula: the Port Townsend/Whidbey Island ferry. This means staying on WA20 and winding along the islands that extend down into the north end of Puget Sound. This doesn’t mean a total avoidance of vehicular congestion, since WA20 is similar to I5 in that it’s the only major through road along the islands. The good news is that it doesn’t last long. The really good news is that you get to ride through Deception Pass. 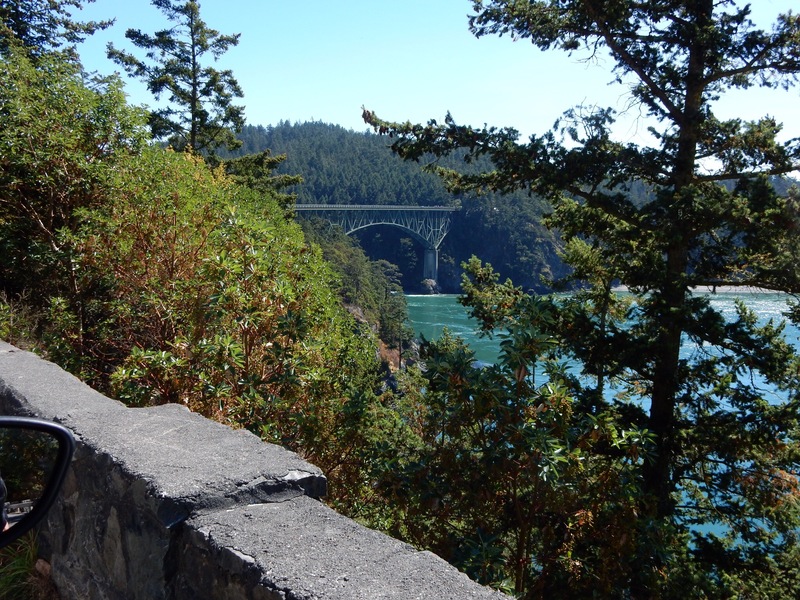 Deception Pass is a narrow inlet bordered by steep cliffs and spanned by a series of impressive arch bridges. I’ve been through Deception Pass several times so this time I stopped for a single photo and moved on. During the stop, I was tempted to capture a short video of the water roiling through the pass in the midst of a rip tide. Very impressive. Continuing south towards the ferry landing, you pass the Whidbey Island Naval Air Station. You can’t actually see the airbase from the road, so passing the station isn’t often an item of note. This time, however, there was a squad of jet fighters circling the base, with two planes at a time peeling off and lining up for landing. I confess that I was weaving around my lane a bit as I craned my head around to watch the jets, flaps extended, gear down, crawling along on final approach. Very cool. Since it is the main thoroughfare on the islands, WA20 winds around a bit to get to it’s terminus at the ferry landing to Port Townsend. Most tourist types blindly follow the road to get to the ferry. Since this isn’t my first rodeo, I knew that I could turn south at the sole stoplight in Coupeville and take a back road to the ferry landing, saving myself at least 10 minutes of further congested WA20 travel. As a bonus, saving these few minutes meant I would be just in time to make the 2:45pm ferry. I love riding ferries on the motorcycle. This is primarily because ferry masters love to cram motorcycles into spaces where a car won’t fit. This means motorcycles are usually the first on (no waiting in line), and first off (no wading through the ferry traffic after you disembark). The ferry ride, as usual, was cool, breezy, and full of impressive views of the sound and the Olympic mountains. I spotted a plume of smoke up in the mountains, probably a wildfire that was going to need some taming. Once the ferry ride was complete, I stopped for gas in Port Townsend and successfully negotiated with Waze to provide a good route down to my friend’s place. Somebody hit a deer and traffic was backed up in both directions whey the car and deer were cleared from the highway, an effort complicated by the deer still being alive and kicking (literally). With the evening commute starting, every stoplight constituted a mile-long backup. The four lane section of WA3 narrows down to one lane (each direction) and the backup for this was several miles long. Plentiful kudos to Waze for noticing me taking an exit and immediately providing an alternative route that took me past the mothball aircraft carriers and onto an High-Occupant-Vehicle (HOV) lane that was actually moving. The construction in Belfair caused a two-mile stop-n0-go torture zone. After Belfair, the trip concluded without incident. I made my way out to the island and parked in my friend’s driveway. I didn’t even have the Nightowl turned off before my gracious host offered me a beer. I’ll be staying here for a few days before the marathon slab blast back to Michigan. Stay tuned. In the meantime, here’s a gallery of the other photos I took this day. The top of the valley just east of Washington Pass. A view down the valley east of Washington Pass. 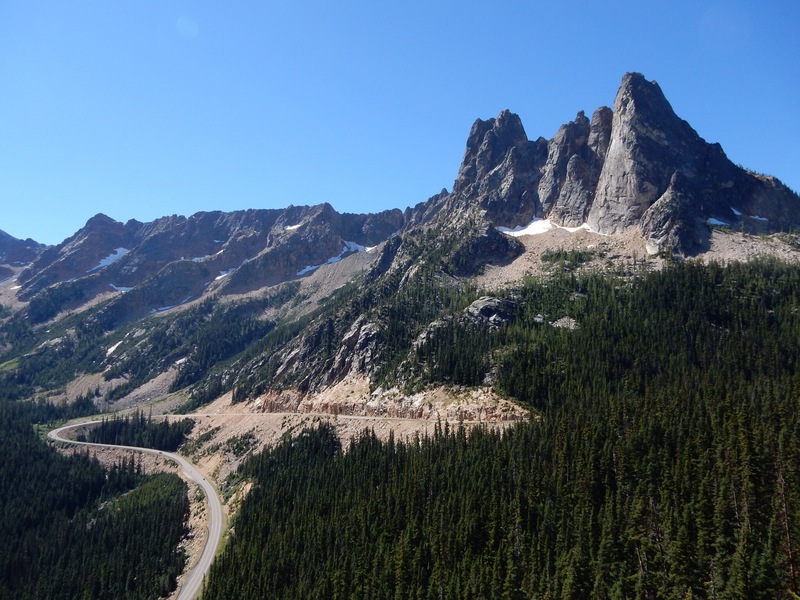 A view of WA20 from the Washington Pass Overlook. A view of the mountains from the path to the Washington Pass overlook. One of the reservoirs in the Skagit River valley. An overview of Diablo Lake. A couple of kayakers and their dog on the island in Diablo Lake. A fishing(?) boat cruises on Diablo Lake. A look towards the eastern extent of Diablo Lake. The southern extent of Diablo Lake. Deception Pass from the north cliff side. The 2:45pm Coupeville/Port Townsend ferry offloads at Whidbey Island. The Nightowl rests in a shady spot in the ferry staging area. Ferry masters love to cram bikes into places where a car won’t fit. The Olympic Mountains from the Port Townsend ferry. Passing the eastbound ferry between Port Townsend and Coupeville. Mount Ranier hides in the haze, as viewed from the Port Townsend ferry. A slightly closer view of the Olympic Mountains. A plume of smoke rises from the Olympic Mountains.